Ron here, with another picture dump of some recently finished models for the NOVA tournament. 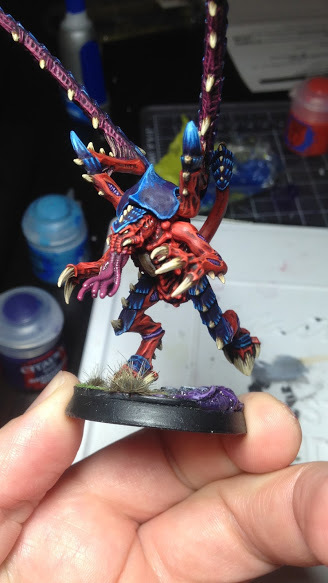 This time I have my second converted Mawloc. Here is a pic dump from a fresh batch of three assembly-lined Lictors. I'm in to the final week before NOVA, so I'm cranking it up to eleven in an effort to be ready in time. My newest Torrent of Fire Article is up. This time I took a look at the six remaining 6th Edition Codices and looked at how they've been faring in terms of popularity and win rates. I found the results actually a bit surprising. Check out the full article and keep your eyes peeled for my NOVA predictions in the next week or so. We are in the final stretch to NOVA; just over a week remaining, and for me, just about five painting days remaining. As I've mentioned, I got a new job recently, but don't start until after NOVA; my last day at my current job is tomorrow, leaving me five business days of painting time, and I have plans for just about every minute. 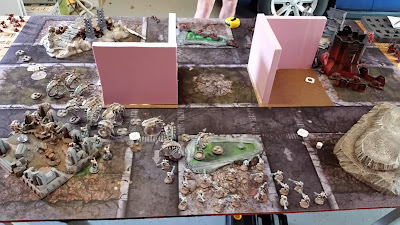 Earlier this week I managed to get a couple play test games in with my Arachnophobia list, against two fellow Invitational players. In both cases we played Crusade (Mission 1) on Vanguard deployment. We also ran out of time to complete both games, but got to turn 4 and were able to postulate on how it would have turned out. 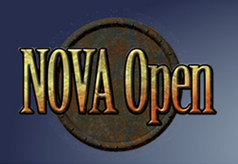 As I alluded to in previous posts, Ron and I will be participating in the 40k Invitational at NOVA this year, competing against some really big names in 40k. The event is a five round, single elimination tournament held the day before the GT. This year, there's even a bracket, which you can fill out and pick the winners. The best bracket wins a pass to NOVA 2016. This past weekend, Ron and Chandler came over and we hobbied late into the night on Friday and Saturday. I hadn't done much hobbying or made much progress toward my NOVA army in the last couple months, but on this weekend I had nearly everything assembled and ready to go. What is up Everyone? This week on the podcast, Bryan, Chandler, and Evan sit down to talk about the newest game to come across their tables: Star Wars Armada. 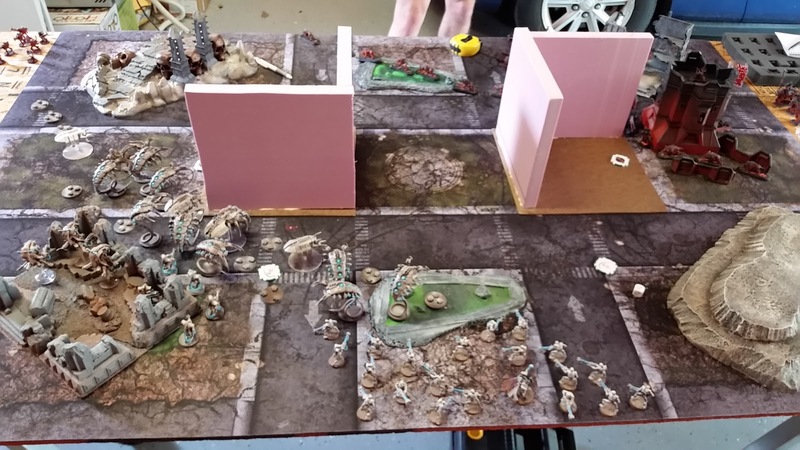 The boys start off by going through a couple of their armies that they are working on, and get into the complexity of building lists that are fun and outside of the box. They then hit the big topic of Armada. What they enjoy, some of the fun things that have happened, and the fact that for such a "simplistic" looking game, it has a depth of strategy that can't be beat. Plus, who doesn't love commanding a Star Destroyer? No Admiral, just another Podcast from the boys at FTGT, and you can't repel fun of this magnitude. 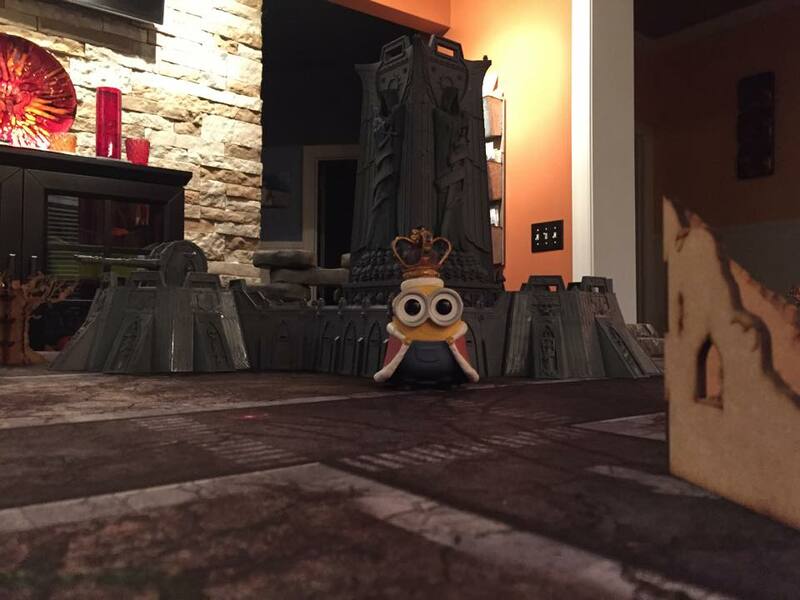 Last week, Will was down to wrap up his Masters defense (congrats to Will) and we got in a few turns of a fun, fluffy game using the scenario from White Dwarf 73 - The Battle of Piscina IV. The scenario is based on Warboss Nazdreg's field test of his Tellyporta technology on the world of Piscina IV, which was defended by the Dark Angels. We settled on 2,025 points give or take 5 points and got to it. My newest Torrent of Fire Article is up. For this article, I used the new Since Date function in the Torrent of Fire Ultimate Weapon and compared army results for before and after their codex was released. I looked at army popularity and performance. Check out the full article and let me know what you think. Next time I'm going to look at how armies holding out with 6th edition codices have fared with each new release. While last week I talked about sticking with my Tyranids for the GT, I'm starting to question if that will end up being the case. Pretty much every one of my friends has pushed for taking the "nastier" list. It is, after all, a tournament, and it would be nice to go better than 4-4 this year. 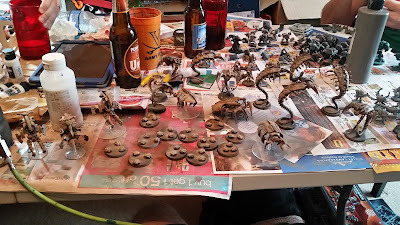 Additionally, one of the main remaining drivers in taking the Tyranids was to improve my score in painting; at this point, I'm concerned I won't finish my planned list and end up subbing in some sub-optimal choices just for painting points.